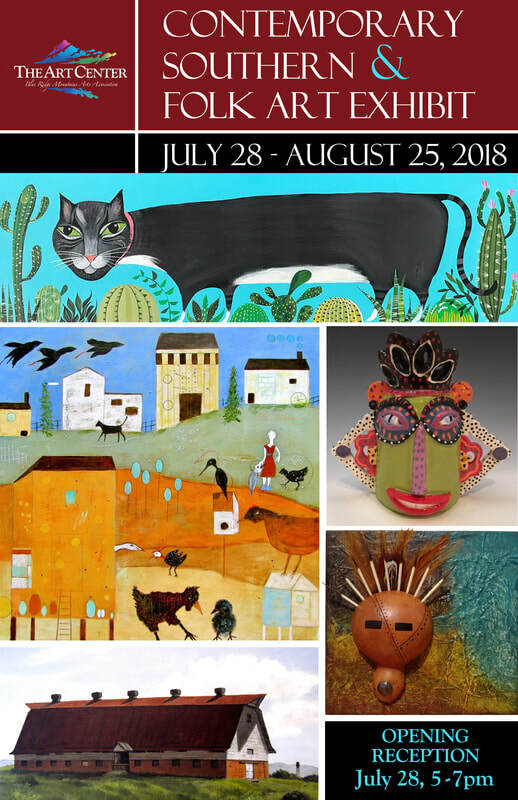 ​ Blue Ridge Mountains Arts Association is proud to showcase a uniquely curated exhibit highlighting the artistry of Contemporary Southern and Folk Art. FOLK ART is the art of the everyday. Folk art encompasses a range of utilitarian and decorative media and if traditional materials are inaccessible, new materials are often substituted, resulting in contemporary expressions of traditional folk art forms. May folk works, such as paintings, sculpture, basketry, and utensils, produced typically by formally "untrained" artists or by artisans of varying degrees of skill, are often marked by such attributes as highly decorative design, bright bold colors, flattened perspective, strong forms in simple arrangements, and immediacy of meaning. Folk Art has often served as the carriers of culture, especially as representing the composite of social norms, customs, forms of behavior, etc., in a society. Art from Southern United States, or SOUTHERN ART, includes southern expressionism, folk art, and modernism. Residents of the American South created works of art starting in 1607, however it was not until the early 1960s that southern art became recognized as a distinct genre. Numerous movements are included in this broad category, but are all connected by the commonality of the Southern cultural experiences that formed the perceptions of the artists. Southern art exists because it was created by Southern artists and its subjects are often representational of those residents of the American South.